Updated with new pictures and additional text (originally posted December 14, 2016). 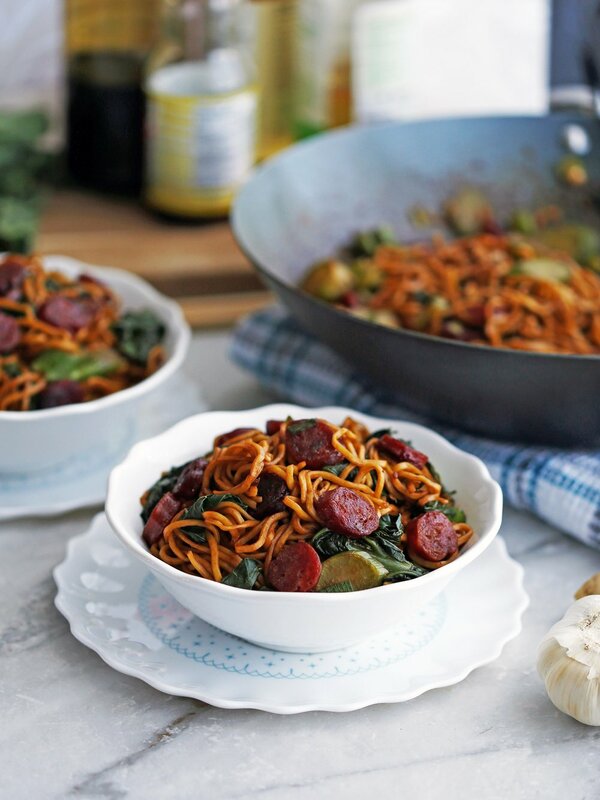 This recipe has three of my favourite things to eat: Chinese egg noodles, lap cheong (Chinese sausage), and gai lan (Chinese broccoli). "Mein" is the Chinese word for noodles. Lo Mein means "tossed noodles," while chow mein means "fried noodles". The noodle used is an egg noodle, which is usually whole wheat flour with egg, and has a long, stringy, and soft texture. The difference in names is due to preparation. More authentic chow mein noodles are fried to crispness separately in the wok and then topped with stir-fried vegetables and meat after. For lo mein (and in this recipe), the noodles are boiled for a couple minutes in a separate pot to al dente before mixing with the rest of the ingredients in the hot wok near the end of cooking. I find that it absorbs the delicious flavours of the sauce so well while holding its shape. Although store-bought labelled chow mein noodles are usually flat or round (I always use it due to personal preference in this recipe; i.e. I grew up eating it) while noodles labelled as lo mein tend to be slightly thicker and round. I'm a bit embarrassed to say, but for months I had labelled this recipe as chow mein instead of lo mein, which is the correct term due to how I prepare it. Growing up, my dad would refer to both methods of preparation as chow mein which caused some confusion. Is it a regional thing? Well, better late than never. So what is Chinese sausage or lap cheong? It's a deep-red, dried, smoked pork sausage with pockets of white fat that is sweet, salty, and well, very fatty. It looks like a shrivelled up sausage before you cook it. It has a unique flavour that you just have to try to really appreciate. When it cooks up in the wok, the fat in the sausage renders and each sausage slice gets crispy and browned on the outside while staying chewy (but really easy to eat) on the inside. In addition to eating these sausages with noodles, I remember eating lap cheong with plain white rice and a fried egg with a runny yolk on top. It was also my favourite part of eating zongzi or joong (Chinese leaf-wrapped sticky rice dumplings). The leafy green called gai lan, or kai lan, Chinese broccoli or Chinese kale (which admittedly I have never heard it referred to as until I did a quick Google search), has flat, large dark blue-green leaves and thick stems. It tastes like broccoli, but slightly more bitter in flavour. I find that it has a sweetness to it that you don't get in other similar Chinese vegetables like Bok Choy. The rich tasting savoury sauce is salty due to the soy and oyster sauces, a little sour from the white rice vinegar, and the sesame oil has a toasty, nutty quality to it. To note, rice vinegar is not the same as regular white vinegar as rice vinegar is less acidic, more delicate, and has a hint of sweetness. In all, the umami flavours in this sauce compliments all the ingredients so well making this one delicious and extremely filling dinner or hearty lunch. To finish it off, this saucy stir-fry noodle dish is sprinkled with fresh green onions for that tasty mild oniony bite. Prepare your ingredients. Chop up the vegetables, cook the noodles, and make the sauce. In a wok on medium-high heat, fry Chinese sausage, garlic, and ginger. Remove from the wok and place it on a paper towel. Increase stove temperature to high heat, steam gai lan stalks first, then add leaves until cooked through. Add the noodles, green onions, and sauce. Toss to combine. Then add back in the sausage, garlic, and ginger to combine. Remove from heat, plate it up and serve it hot. All together it is a FLAVOUR EXPLOSION that is easy and fast to make. The key is to chop and prepare all the ingredients first so that once you start cooking, you have all the ingredients ready to toss into the hot wok. It's also really easy scale up or down this recipe so you can make as much as you want. Boil the noodles according to the package directions until al dente, rinse with cold water and drain. Set aside. In a small bowl, whisk together the sauce ingredients until well combined. Set aside. Set the stove temperature to medium-high heat. In a wok, add the Chinese sausage, ginger, and garlic. Stir frequently, letting the sausage fat render, and allowing the ginger and garlic to brown, about 2-3 minutes. Remove the ingredients from the wok and place on top of a paper towel. Leave the remaining fat in the wok. Increase the stove temperature to high heat and stir in the gai lan stems and 2 tablespoons of water, cover with a lid** and let it steam, until crisp tender, about 3 minutes. Then, stir in the gai lan leaves and remaining 2 tablespoon of water and let it steam until it is completely cooked, about 2-3 minutes. Add the noodles, green onions, and the sauce. Using tongs, toss the ingredients until it is well-coated with the sauce, about 2 minutes. Finally, add back the sausage, garlic, and ginger and combine before removing from the heat. Serve immediately. *I like to use steamed chow mein noodles (aka Hong Kong-Style Pan-Fried Noodles). You can also find labelled packaged Lo Mein Noodles. In a pinch, substitute with spaghetti or linguine. **If you do not have a lid for your wok (I used a large lid that belongs to another pot), you can cover the wok with a large metal bowl or aluminum foil. Be careful when removing the lid. You can also boil in shallow water in the wok if you prefer not to use a lid. If gai lan is not available, you can substitute with bok choy, broccoli, or green cabbage.